Since January it’s been chaotic. 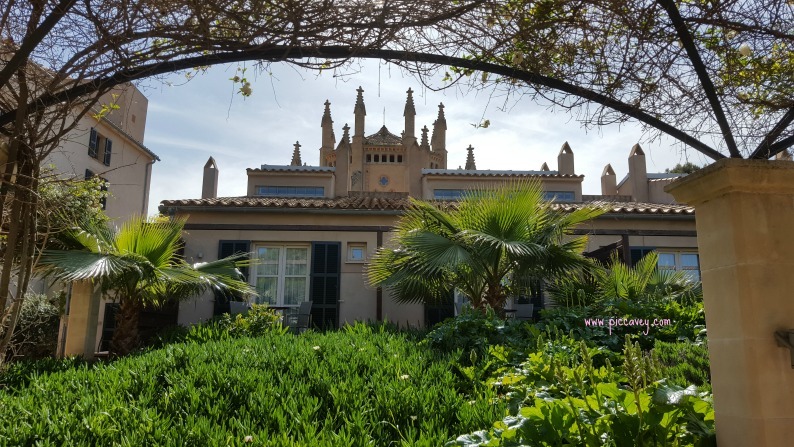 It was great to get away to Mallorca, away from the whirlwind of activity, with a busy blog and a full time job, Easter flew by without me even noticing. I decided soon afterwards that a few days to unwind were in order. Travelling in Andalusia is something I love (if you are a regular reader you will have noticed ; ). Keen to take notes on my travels, get photos of everything and make sure no stone is left unturned is my usual plan. For a relaxing break I should visit somewhere a little off the beaten track, easy to get to and far from Andalusia. My local airport Federico García Lorca offers four routes. Currently connecting with Barcelona, Madrid, London City and Palma de Mallorca. Vueling operate the route from Granada to Palma and prices are competitive. So this was the perfect option for a stress free Mallorca weekend. 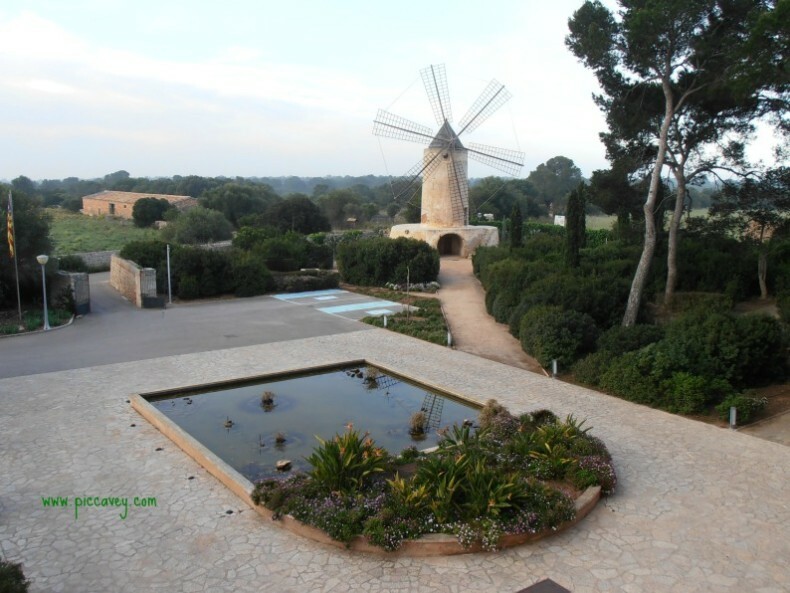 I hadn´t visited the Balearic Islands since 1999 when I travelled to Formentera. Seems like a lifetime ago. April was after the Easter holidays and before the school break so it shouldnt be too busy. The weather forecast was mild, spring temperatures with cooler evenings. I booked the flights, hire car and accommodation just a few weeks ahead of the trip. I´d leave on Friday and return on Sunday night. On arrival to Palma de Mallorca airport I hired a car with Sixt España. My plan was to explore some of the island on my weekend away. From Palma de Mallorca in the South up to Pollensa it takes about 50 minutes’ drive (motorway). Mallorca it´s a good location for short road trips. 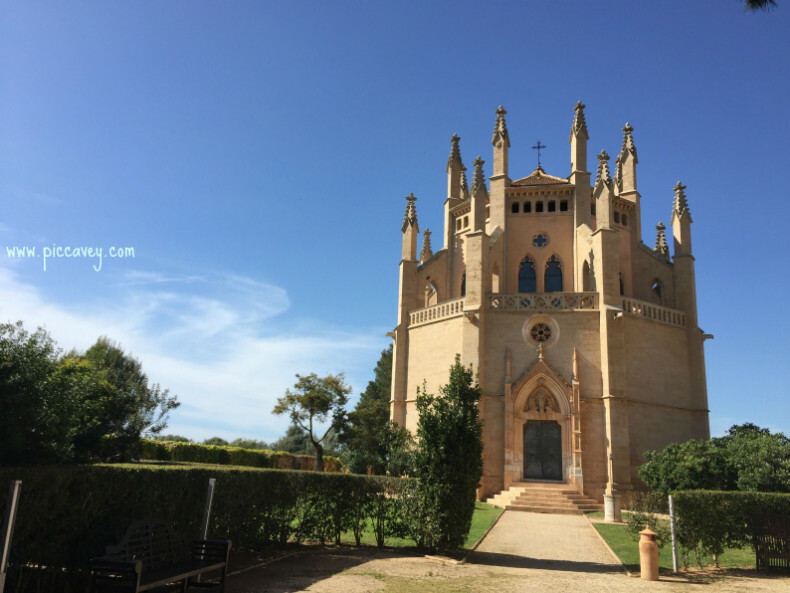 Also Mallorca has just received the Travellers Choice as the Best Island in Spain and the 2nd best in Europe, so I wanted to go and check it out first hand. After collecting the car the drive was just 20 minutes from the airport to the hotel. Just over 20 kms (13 miles) from Palma airport to Sa Torre driving inland. (Close to Llucmajor) As we left the motorway for smaller roads. Passing typical windmills, stone walls separating land and lots of dainty spring flowers. After 8 kms of rural idyll we arrived at the hotel. 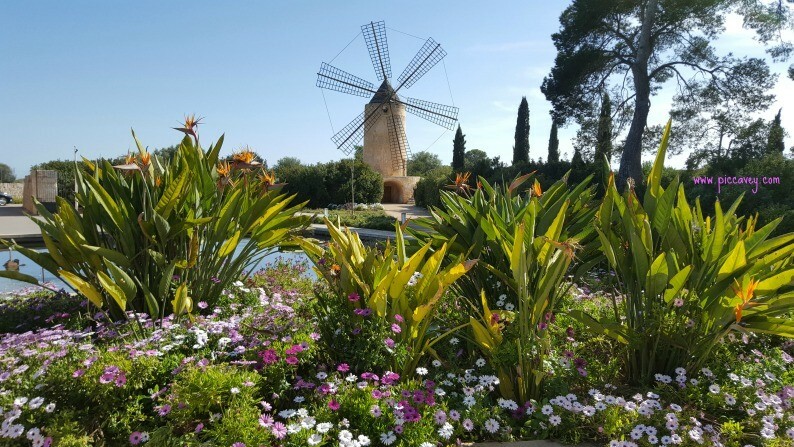 If you prefer not to drive of course you can arrange arrange a taxi with Palma airport transfers to get directly from the airport to Sa Torre. 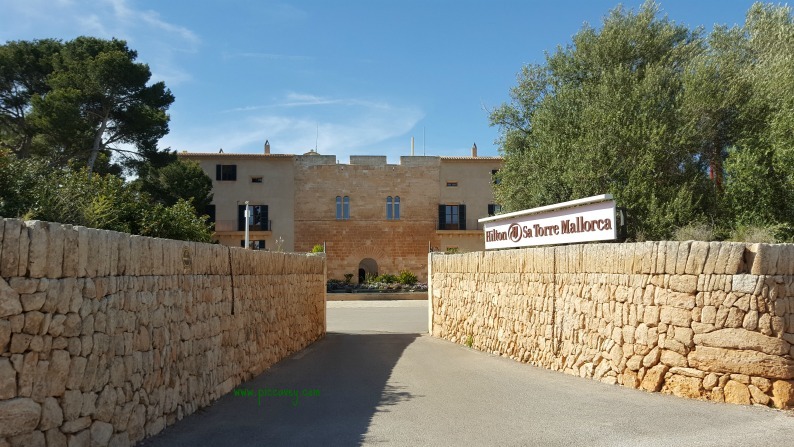 The Hilton SaTorre is a 15th century rural estate with its own windmill and ample grounds. The history of the site actually dates back to 1369. The oldest part is the main building which forms the heart of the hotel. The main door is inscribed In stone with the 1540 on the archway. On arrival at the hotel, there was plenty of space for parking at the front of the building. Equipped with our suitcases we past the main gate and crossed the elegant courtyard. We had hardly crossed the threshold when the porter came out to greet us and take our cases.On entering reception, we were offered welcome drinks, gratefully received after the flight from Granada. Checking in was a fuss free process and we were taken to our room. Home for the weekend was a comfortable setting with large terrace overlooking the estate. We could see three horses running around in the fields opposite the hotel. I certainly was going to unwind this weekend in such a peaceful location. The room was well equipped. (I´ve never seen digital bathroom scales in a hotel before). Even the colour scheme was easy on the eye, aquas, beige and chocolate hues. The interiors are created by renowned interior designer Mercedes González López-de-Carrizosa (also Hotel Ritz). There was a pillow menu in case the size or shape of the pillows didn´t suit. After leaving the cases behind, we popped downstairs to have lunch in the courtyard. This way we could make plans for the weekend ahead in the sunshine. The Sa Claustra bar has cocktails (with and without alcohol). Also a selection of casual dining options. We chose a Caesar Salad and a tasty Beef Pizza. I´m fussy about Caesar salad lately. Don´t like breaded chicken to used or odd variations either. Here the chicken was grilled and there was plenty if it too. 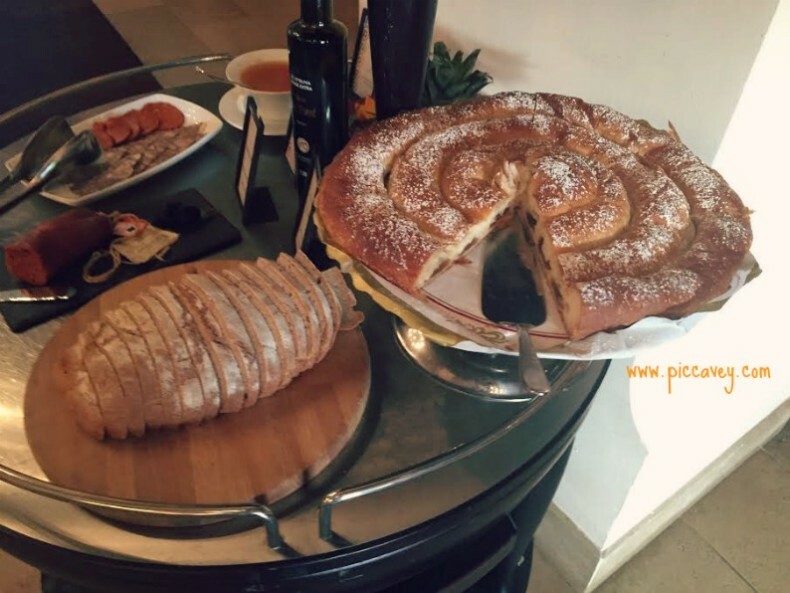 As we chose only one dish we had room for dessert and had a berry strudel and chocolate cake. One of the desserts came with a few berries as a garnish. The taste of them was superb. Fruit with an Ultra-fresh and strong fruity taste. After lunch I wanted to explore the historic estate. Next to the main building is the Neo gothic chapel. ¨La Gran Cristiana”. A stunning building which is used for weddings here. Built in 1872 this charming space has room for 120 guests. An octagonal shape this makes a photogenic backdrop surrounded by gardens and plants. As I leave the chapel behind and head deeper into the hotel grounds. 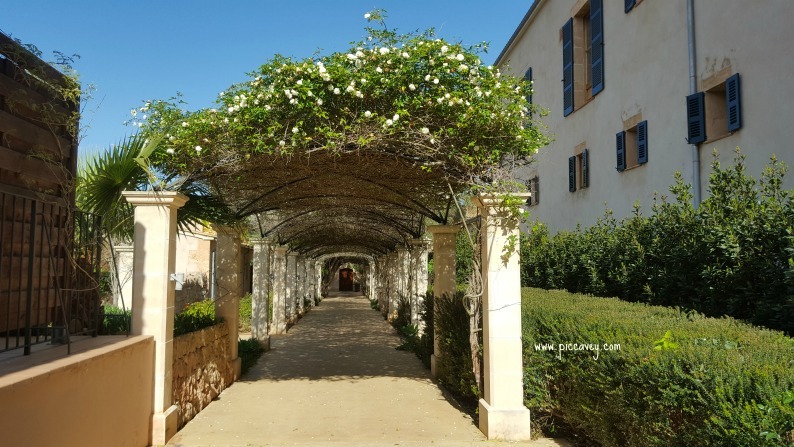 The surroundings are dotted with fragrant lavender, lilac wisteria flowers and rambling white roses. A little farther along I come to the swimming pool area. At Hilton SaTorre there are two pools, one for adults and one for children. 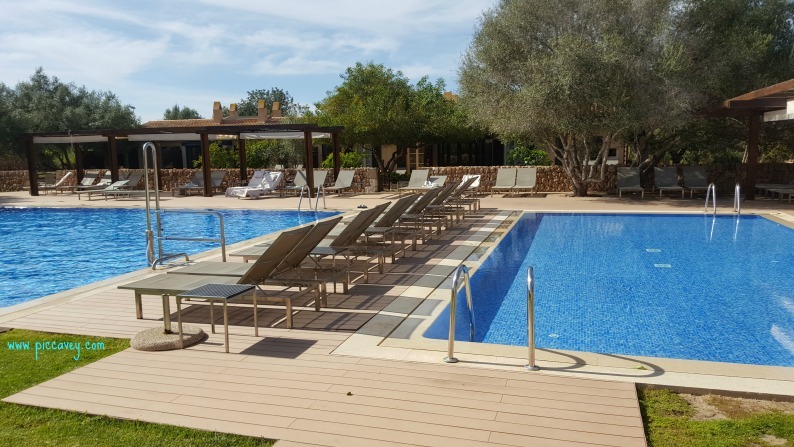 There is an poolside bar and ample space for sun loungers. The pool area is partially enclosed with trees and plants. Following the path along past the pool you reach the full size football ground. Then come to a cross country running track. A 1.5km circular route through part of the estate allows you to jog or walk without leaving the complex. A great way to get the exercise in while you are away from you daily routine. As walk back to the main building I take a look at the Windmill at the main entrance. 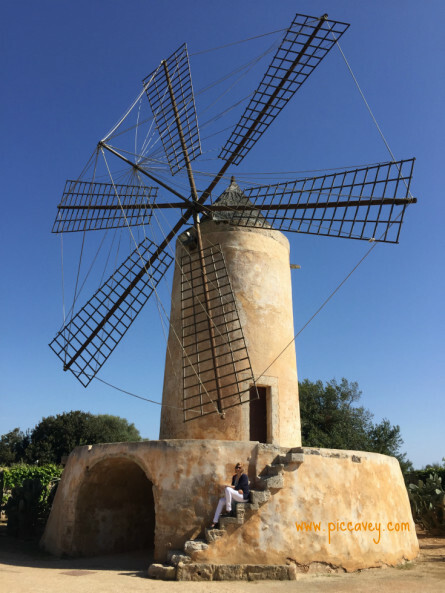 This 15th century Flour Mill was built to mill grain, salt and flour. It would have had cotton sails originally and the miller would have lived in the base of the windmill. The machinery that milled the grain was at the top part of the mill. The mill is lit up in the evenings and provides a dramatic impression when you first enter the property. There is no doubt that you are in Rural Mallorca. At 7pm that day I had booked a facial treatment in the spa. As they are using organic products and locally made cosmetics, It pleased me to discover Spanish brands I´d not used before. Dulkamara is an organic cosmetic brand from Northern Spain which I’d not come across. SaTorre use this in their facial treatments. The products are made from Organic Bamboo which liberates silicon, said to reinforce the framework for the skin. The cosmetics don´t contain parabens or synthetic additives either. As I have sensitive skin I am always cautious about skincare especially on my face. This treatment did seem to reenergise my skin even with just a 30 minute treatment. My face seem to be firmer and more radiant. Based in Navarra I will look out for Dulkamara stockists on my travels in Spain. I was also given a leg massage with products by Pure Spa. Made locally in Mallorca with Rosemary, lavender and other local ingredients. On the list of services on of the things that caught my eye was the spa treatment for sunburn. A great idea. After my facial, I just had time to get ready for dinner. The Arxiduc restaurant had three course dinner service that evening. We didn’t actually feel like heading out anywhere after the busy travel day we´d had. The dining room had an informal yet elegant setting. The pastel striped chairs reminded me of the seaside but the high ceilings made a select atmosphere. The staff were friendly and accommodating. Before ordering we were greeted with a glass of cava and a canape of roasted courgette. For dinner I chose Tomato soup for starter and cod for the main course. The other options were Seafood timbal and Entrecotte. All the portions were good sizes but not too much. As lunch had been light I managed to finish the food. The quality was high and the choice between two starters and two mains was no problem at all. It was clear that they had selected the best offer of the day. Dessert was delicious ice cream. Mango and raspberry flavours natural juices of the fruit bursting through. 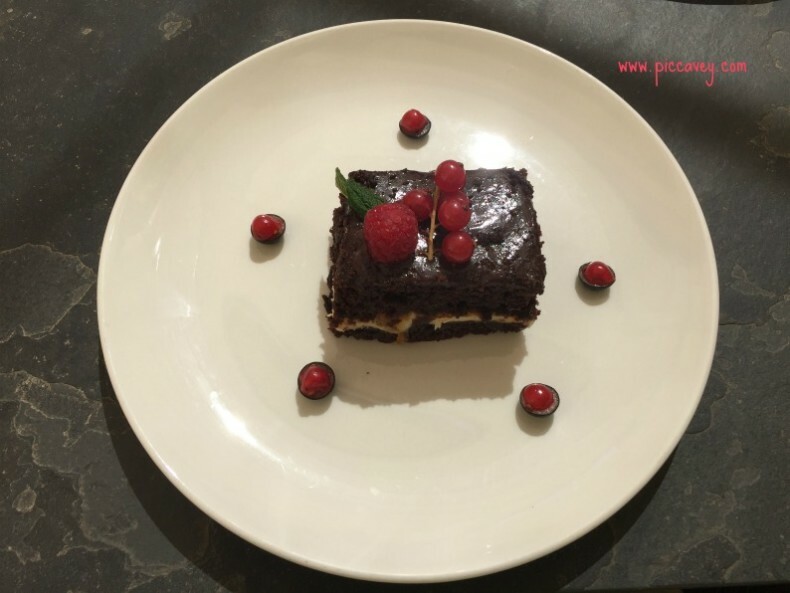 The other dessert that evening was Fire on the table. An imaginative idea to get the nostalgia going. 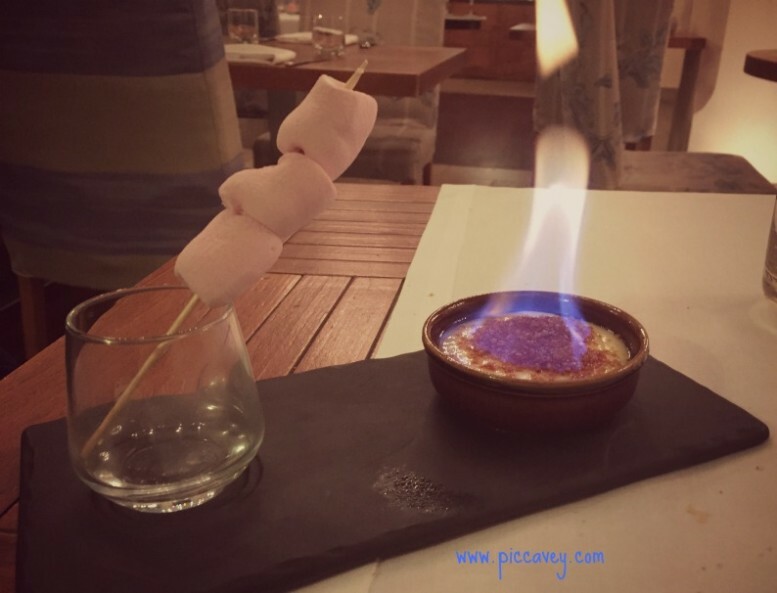 Toasted marshmallows and crème brulee. This is my favourite Spanish pastry. When I lived in Barcelona I ate lots of it but it’s trickier to find in the south of Spain. The assortment of bread on offer was huge and also I have mention the coffee which was perfection. A frothy café con leche. Other hotel stays recently have the dreaded machine and it never seems to come out how you hope. So after the enjoying breakfast we took the car for a short drive to Ses Salines and the Es Trenc Beach. 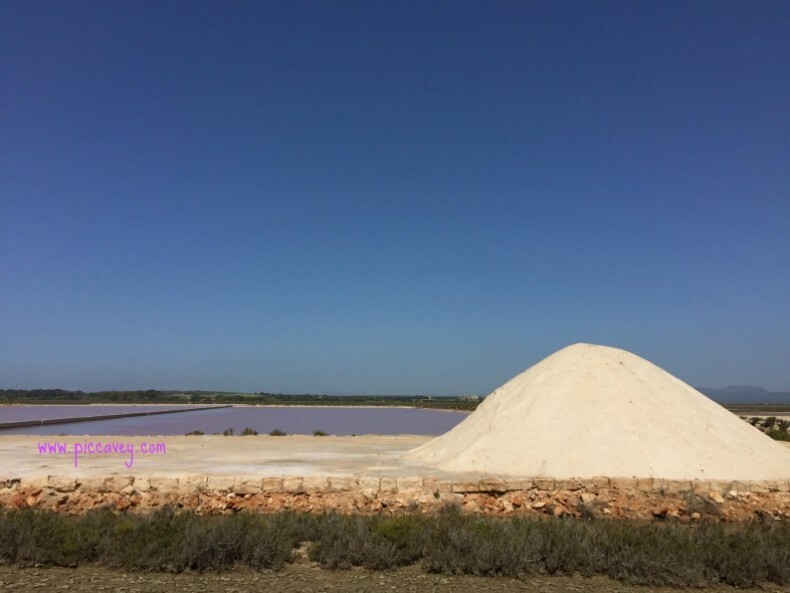 Ses Salines is a natural salt flats which produces sea salt. This curious landscape is interesting to see on the way to Es Trenc beach. There is a little factory and shop on the road which you may visit. Hotel SaTorre offers a beach shuttle in high season so you don’t have to bother with a car to get to the beach. 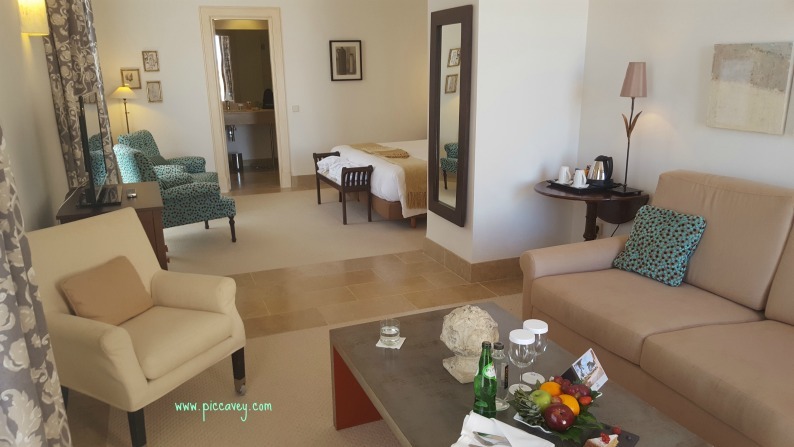 The only down side of this experience in Hilton Sa Torre Mallorca was having to leave. There were some things that I didn´t manage to do in just a weekend. The visit to Bodegas Bordoy will be on the plan for my next visit. 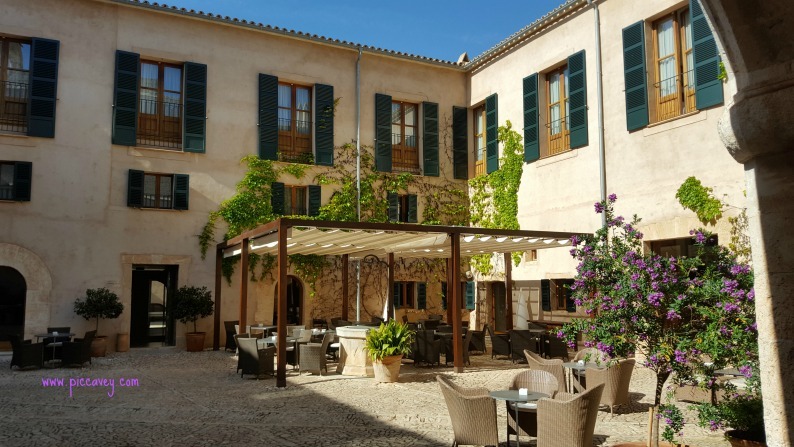 I have signed up to the newsletter to get the special offers for this hotel. Can´t wait to find any excuse to return. This trip has several things I love: local products (ensaimadas, delicious! ), amazing places, great experiences. Mallorca is one of my favourite places for a holiday. Thanks for the tips!